The Independent Living (IL) Movement, as we know it today, began with the establishment of a consumer-controlled, self-help centre in 1972.The Berkeley Centre for Independent Living was started by a group of students with disabilities at the University of California. This IL Movement, with its philosophy, principles, and attitude was introduced into Canada by Gerben DeJong at the COPOH National Conference – “Parameters of Rehabilitation” in Vancouver in 1980. The main focus of this article will be how the IL Philosophy is manifested in the Independent Living Resource Centres (ILRCs). I offer two caveats: first, it is difficult, if not impossible, to understand Independent Living separately from its historical and social context (Dejong, 1980)ii; second, Independent Living is almost universally misunderstood. According to Woodill (1992), “The phrase ‘Independent Living’ has been part of social service discourse since the end of World War II… because of its long history in the professional literature, as well as its use by recipients of professional services, there are several meanings to the term…” iii In Ontario, for example, it is common to be told that Independent Living refers to one of two things: a person in a wheelchair, living alone in an accessible apartment; or, some sort of technical device such as a walker or bath bench. In addition, the term has been associated with accessible housing, transitional living centres, hospital units, the study of home economics, rehabilitation programs and so on. In reality, the term, ‘Independent Living’ actually refers to a flourishing but little known social movement. Disabled people should be as integrated as possible into the community. In summary, the Independent Living movement evolved as a social movement or struggle for civil liberties by persons with a disability using self-help tactics. The idea of one disabled person helping another was revolutionary since it is not unusual, even today, for persons with a disability to avoid each other. Independent Living is really about interdependence, not living in isolation. What is Independent Living in Canada? The Independent Living Philosophy in Canada has evolved differently than in the United States. According to IL Canada’s ELIGIBILITY CRITERIA FOR IL CANADA MEMBERSHIP (ECCM) v, the key elements of ‘Independent Living’ have a dual purpose. For the individual, IL is an attitude; for an ILRC, it is a set of organizational principles as well as a set of program methods and resources. An ILRC must use a consumer-controlled, community-based, cross-disability approach as a basis for operation. For example, in a typical ILRC, the Board of Directors, the Executive Director and the core staff consist mostly of persons with disabilities. The Board of Directors must, by law, be fifty-one per cent disabled persons. Furthermore, the core programs fundamental to every ILRC are Information and Referral, Peer Support, Individual Advocacy/Skills Development and development of new forms of service delivery (research and development). As a method for carrying out the mandate, the core programs reflect the organizational principles. At its most fundamental level, an Independent Living Resource Centre is a place where individuals with a disability can learn to control their own life. They can become aware of their options, make choices, and take risks all with the support of someone else who has been there before them. A Centre is a place where persons with a disability can help each other. On a final note, Independent Living Canada consists of 26 thriving Independent Living Resource Centres across Canada, from Newfoundland-Labrador to Vancouver Island, with are 12 ILRCs right here in Ontario. The national body located in Ottawa, has a Board of Directors made up of Executive Directors from local centres. Currently 33 persons work at CILT and there are 12 persons on our board of directors, 16 of these with disabilities. i. Published in Research Network for Social Participation RNSP Network Bulletin Vol 1 No 4, Dec 1995, pp 2-3.
ii. DeJong, Gerben. “Rehabilitation and the Challenge of Independent Living”, speech given at COPOH’s meetings May 3, 1980 in Vancouver, British Columbia. iii. Woodill, Gary. 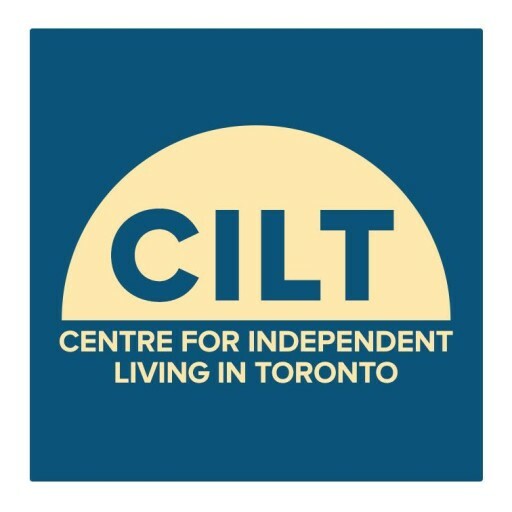 Independent Living & Participation in Research: A Critical Analysis (Toronto: Centre for Independent Living in Toronto (CILT) Inc., 1992), p. 24.
iv. Zukas, Hale.”CIL History” (Berkeley: Centre for Independent Living, Inc., 1979). v. Canadian Association of Independent Living Centres, ELIGIBILITY CRITERIA FOR IL Canada MEMBERSHIP (ECCM) (Ottawa: IL Canada, 1990), p. 2.